Mṛcchakatika Sanskrit: mr̥cchakaṭikā (मृच्छकटिका), also spelled Mṛcchakaṭikā, Mrchchhakatika, Mricchakatika, or Mrichchhakatika (The Little Clay Cart) is a ten-act Sanskrit drama attributed to Śūdraka, an ancient playwright whose is possibly from the 5th century AD, and who is identified by the prologue as a Kshatriya king as well as a devotee of Siva who lived for 100 years. The play is set in the ancient city of Ujjayini during the reign of the King Pālaka, near the end of the Pradyota dynasty that made up the first quarter of the fifth century BC. The central story is that of a noble but impoverished young Brahmin, Sanskrit: Cārudatta, who falls in love with a wealthy courtesan or nagarvadhu, Sanskrit: Vasantasenā. Despite their mutual affection, however, the couple's lives and love are threatened when a vulgar courtier, Samsthānaka, also known as Shakara, begins to aggressively pursue Vasantasenā. 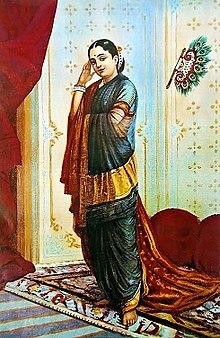 An oleographic print depicting the female protagonist Vasantasenā, a rich courtesan. Rife with romance, comedy, intrigue and a political subplot detailing the overthrow of the city's despotic ruler by a shepherd, the play is notable among extant Sanskrit drama for its focus on a fictional scenario rather than on a classical tale or legend. Mṛcchakaṭika also departs from traditions enumerated in the Natya Shastra that specify that dramas should focus on the lives of the nobility and instead incorporates a large number of peasant characters who speak a wide range of Prakrit dialects. The story is thought to be derived from an earlier work called Cārudatta in Poverty by the playwright Bhāsa, though that work survives only in fragments. Of all the Sanskrit dramas, Mṛcchakaṭika remains one of the most widely celebrated and oft-performed in the West. The work played a significant role in generating interest in Indian theatre among European audiences following several successful nineteenth century translations and stage productions, most notably Gérard de Nerval and Joseph Méry's highly romanticised French adaptation titled Le Chariot d'enfant that premiered in Paris in 1850, as well as a critically acclaimed "anarchist" interpretation by Victor Barrucand called Le Chariot de terre cuite that was produced by the Théâtre de l'Œuvre in 1895. Unlike other classical plays in Sanskrit, the play does not borrow from epics or mythology. The characters of Śūdraka are drawn from the mundane world. It is peopled with gamblers, courtesans, thieves, and so on. The protagonist of the play, Cārudatta, does not belong to the noble class or royal lineage. Though Vasantasenā is a courtesan, her exemplary attitude and dignified behavior impress the audience. The nobility of the characters does not stem from their social conditioning but from their virtues and behaviour. Cārudatta is a generous young man who, through his charitable contributions to unlucky friends and the general public welfare, has severely impoverished himself and his family. Though deserted by most of his friends and embarrassed by deteriorating living conditions, he has maintained his reputation in Ujjayini as an honest and upright man with a rare gift of wisdom and many important men continue to seek his counsel. Though happily married and the recent father of a young son, Rohasena, Cārudatta is enamored of Vasantasenā, a courtesan of great wealth and reputation. At a chance encounter at the temple of Kāma she returns his affection, though the matter is complicated when Vasantasenā finds herself pursued by Samsthānaka, a half-mad brother-in-law of King Pālaka, and his retinue. When the men threaten violence, Vasantasenā flees, seeking safety with Cārudatta. Their love blossoms following the clandestine meeting, and the courtesan entrusts her new lover with a casket of jewelry in an attempt to ensure a future meeting. Her plan is thwarted, however, when a thief, Sarvilaka, enters Cārudatta’s home and steals the jewels in an elaborate scheme to buy the freedom of his lover, Madanikā, who is Vasantasenā’s slave and confidant. The courtesan recognizes the jewelry, but she accepts the payment anyway and frees Madanikā to marry. She then attempts to contact Cārudatta and inform him of the situation, but before she can make contact he panics and sends Vasantasenā a rare pearl necklace that had belonged to his wife, a gift in great excess of the value of the stolen jewelry. In recognition of this, Cārudatta's friend, Maitreya, cautions the Brahmin against further association, fearing that Vasantasenā is, at worst, scheming to take from Cārudatta the few possessions he still has and, at best, a good-intentioned bastion of bad luck and disaster. Refusing to take this advice, Cārudatta makes Vasantasenā his mistress and she eventually meets his young son. During the encounter, the boy is distressed because he has recently enjoyed playing with a friend's toy cart of solid gold and no longer wants his own clay cart that his nurse has made for him. Taking pity on him in his sadness, Vasantasenā fills his little clay cart with her own jewelry, heaping his humble toy with a mound of gold before departing to meet Cārudatta in a park outside the city for a day’s outing. There she enters a fine carriage, but soon discovers that she is in a gharry belonging to Samsthānaka, who remains enraged by her previous affront and is madly jealous of the love and favor she shows to Cārudatta. Unable to persuade his henchmen to kill her, Samsthānaka sends his retinue away and proceeds to strangle Vasantasenā and hide her body beneath a pile of leaves. Still seeking vengeance, he promptly accuses Cārudatta of the crime. Though Cārudatta proclaims his innocence, his presence in the park along with his son's possession of Vasantasenā's jewels implicate the poverty-stricken man, and he is found guilty and condemned to death by King Pālaka. Unbeknownst to all, however, the body identified as Vasantasenā’s was actually another woman. Vasantasenā had been revived and befriended by a Buddhist monk who nursed her back to health in a nearby village. Just as Cārudatta faces execution, Vasantasenā appears and, seeing the excited crowd, intervenes in time to save him from execution and his wife from throwing herself onto the funeral pyre. Together the three declare themselves a family. Reaching the courts, Vasantasenā tells the story of her near death and, following her testimony, Samsthānaka is arrested and the good Prince Āryaka deposes the wicked King Pālaka. His first acts as the newly declared sovereign is to restore Cārudatta’s fortune and give him an important position at court. Following this good will, Cārudatta demonstrates in the final act his enduring virtue and charity, appealing to the King for pardon on behalf of Samsthānaka who is subsequently declared free. Play adaptions: The play was translated into English, notably by Arthur W. Ryder in 1905 as The Little Clay Cart. (It had previously been translated as The Toy Cart by Horace Hayman Wilson in 1826.) Ryder's version was enacted at the Hearst Greek Theatre in Berkeley in 1907, and in New York City in 1924 at the Neighborhood Playhouse, which was then an off-Broadway theatre, at the Theater de Lys in 1953, and at the Potboiler Art Theater in Los Angeles in 1926, when it featured actors such as James A. Marcus, Symona Boniface and Gale Gordon. The play has been adapted in several Indian languages and performed by various theatre groups and directors, like Habib Tanvir. Film adaptations: The first silent film of Kannada film industry, Mricchakatika (Vasantsena) (1931), starring Kamaladevi Chattopadhyay, Vasantasena, a 1941 Indian Kannada film directed by Ramayyar Shirur, and Utsav, a 1984 Hindi Bollywood film by Girish Karnad was based on an adaptation of this play. ^ a b Richmond, Farley P. (1990). Farley P. Richmond; Darius L. Swann; Phillip B. Zarrilli (eds.). "Characteristics of Sanskrit Theatre and Drama" in Indian Theatre: Traditions of Performance. Honolulu: University of Hawaii Press. pp. 55–62. ISBN 0824811909. ^ a b Oliver, Revilo Pendelton (1938). Rozelle Parker Johnson; Ernst Krenn (eds.). "Introduction to 'The Little Clay Cart.' " in Illinois Studies in Language and Literature 23. Urbana: University of Illinois Press. pp. 9–44. ^ Basham, A. L (1994). Arvind Sharma (ed.). The Little Clay Cart: An English Translation of the Mṛcchakaṭika of Śūdraka, As Adapted for the Stage. Albany: State University of New York Press. ISBN 0791417255. ^ Śūdraka. Revilo Pendelton Oliver; Rozelle Parker Johnson; Ernst Krenn (eds.). "Mṛcchakaṭikā, The Little Clay Cart: A Drama in Ten Acts Attributed to King Sūdraka." in Illinois Studies in Language and Literature 23=1938. Urbana: University of Illinois Press. pp. 45–210. ^ Wohlsen, Marcus (2005). "The Greatest Show on Earth: The First Indian Play Performed at UC Berkeley -- And Anywhere in the United States -- Took the Stage of the Greek Theater in 1907, Along with Elephants, Zebras, and a Cast of Hundreds". Illuminations. University of California Berkeley. Archived from the original on 16 February 2012. Retrieved 17 July 2012. ^ "Prof. A. W. Ryder, of Sanskrit Fame; Head of That Department at University of California Dies in Classroom". New York Times. 22 March 1938. ^ Bracker, Milton (7 June 1953). "Story of a Determined Lady: Terese Hayden, Sponsor of New Play Series at Theatre de Lys, Is Undaunted Despite Disappointments in the Past". New York Times. p. X3. ^ Schallert, Edwin (9 December 1926). "'Clay-Cart' Hero Wins: 'Twas Ever Thus—Even in the Sanskrit". Los Angeles Times. p. A9. The Little Clay Cart by Shudraka, full text of translation by Arthur William Ryder (1905).